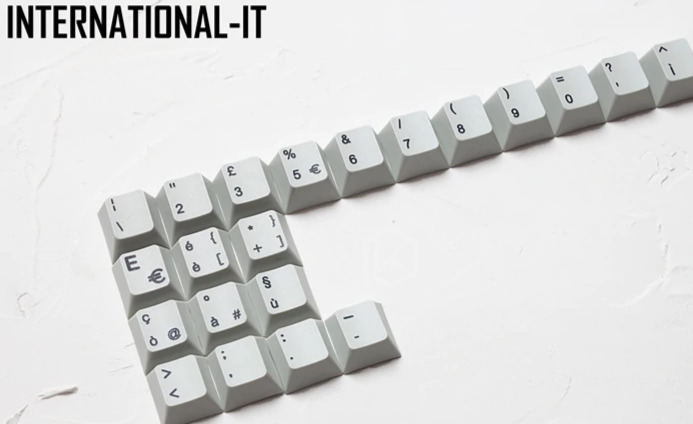 I found a little ray of sunshine for ISO fans: Two days ago, a guy named Mito announced his intention to create a new set of SA-profile keycaps, complete with ISO and NORDE keys. Please do not be worried by the novelty-key-covered render on the project's main page. If you scroll through the kits themselves, you will see that Mito intends to offer standard (novelty-free) kits as well. I see they have an international kit but I don't see IT accent letters. Not sure I can post the link, but you can find them quite easily as "kprepublic international". Most of the European Layouts are available. base kit+ modifier+iso+international are about 60$. I'll let you know how they are (in a month or so...). Last edited by Cholo on 06 Apr 2019, 19:27, edited 1 time in total. The compose key: I'm astonished it never found its way into Windows as it's so useful for doing stuff like this on any keyboard without needing to know arcane and obscure control codes. There are a few fiddly examples (e.g. ñ is particularly irritating to type IME) but they can generally be reprogrammed with little effort; plus you get to write things like Spın̈al Tap properly. The IBM Selectric, (which interestingly also had an "ISO style" Enter key for all regions) had an optional dead key feature for this very reason. In fact, the Selectric II keyboard is one of my all-time favourites. That's quite interesting. I've hear all sorts of awesomeness about the Selectric thanks to the likes of alt.folklore.computers but had no idea about the intended/implied/whatevs compose key. I'd always assumed that was a DEC innovation, though I admit I'm biased being an ex-Deccie and "my first (proper) computer was a Vax". As for the "ANSI or GTFO" thing, I guess it's part of that "all the world is (not) America" mind-set: shades of being repeatedly told off for not writing English properly for using, erm, English spellings.